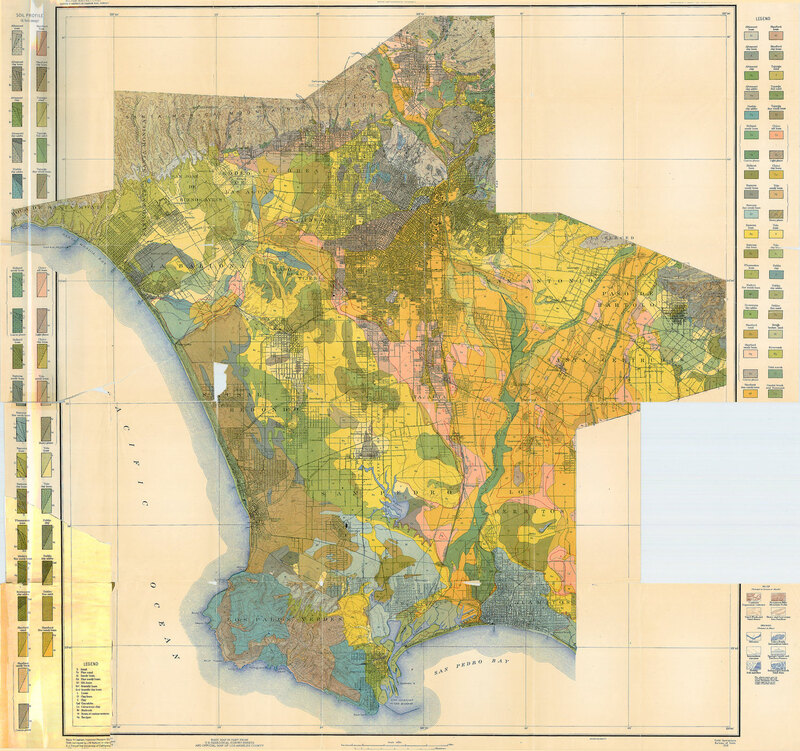 We deal mostly with old maps here and this one is as old as dirt—that is, Los Angeles soil as categorized by the pedologists who worked for a large-scale, federal agricultural study conducted by the US Department of Agriculture. The USDA goes dates back to the presidency of Abraham Lincoln, who formed the agency in May of 1862 when the country was still mostly agrarian. Originally, the agency was interested in finding seeds to plant in the most advantageous places in the country but later expanded to serve all facets of farming and horticulture. With the Smith-Lever Act in 1914 the USDA reached out to every single county in the country with cooperative extension services to study and teach about, among other things, soil. It might be coincidence that this map represents a survey completed in the same year Los Angeles entered World War I, but it’s worth noting that California supplied plenty of food for our troops during the 20 months America fought in the Great War. The new Los Angeles Aqueduct had been pumping water into the basin for the past three years and agricultural prospects were looking up in L.A. County. This surprisingly engaging map relies heavily on data produced in a thorough soil survey completed in 1903. The variety and complexity of the ground under our feet is amazing. While the colors shown in the legend border describe variations of loam (sandy loam, silt loam), sand, adobe, riverwash, tidal marsh, clay, and even peat, there are 50 soil classifications in L.A. County alone. On the left border are soil profiles showing depths, from one foot in some cases to six full feet of material like Maricopa Sandy Loam that would have washed down from the mountains and been carried by the Los Angeles river and its tributaries across the flatlands. In places like Tropico this would make for growing strawberries, grapes, oranges, peaches, and apricots. Fresno sand might cover places like Artesia and Norwalk where grapes were grown for wine. Widespread across the city of Los Angeles and now covered by lots of asphalt is a Hanford Sandy Loam which once ranged up to six feet in depth and gave way to Altamont Clay Loam in hillsides to the northeast where wildflowers grew in abundance. The map details local topography, water sources, and even city streets while maintaining the old rancho names within the county.